Most businesses want to grow. In today’s global market an important part of growth is geographical expansion. This type of growth has not always been easy or even possible, especially for SMBs with a tighter budget. Legacy telephony would have required a new, expensive phone system for each new office or location. 1. Hosted VoIP offers the ability to work from home. While working from home was previously undesirable to employers and detrimental to collaboration, cloud VoIP makes it an ideal situation. Modern VoIP tools like gloCOM make it so that home workers perform as if they were in the office, or maybe even better. Clients will not know the difference and coworkers or supervisors can be in constant, real-time collaboration. 2. Hosted VoIP makes growth more cost-effective. With hosted VoIP, telecoms can add new locations without investing in a new telephony system for them. With as little a local Internet connection, offices across the world can connect to the central hosted VoIP system and function immediately. This makes growth less of an economic risk. 3. Hosted VoIP is flexible. Along those same lines, growth with a hosted VoIP system is more flexible. The low economic risk means lesser consequence in case of slow or no growth. With SIP trunking, it easy to scale up or down and use only as much of the system as needed. For example, during peak times it would be easy to add temporary extensions that would later be removed. 4. Hosted VoIP gives you peace of mind. 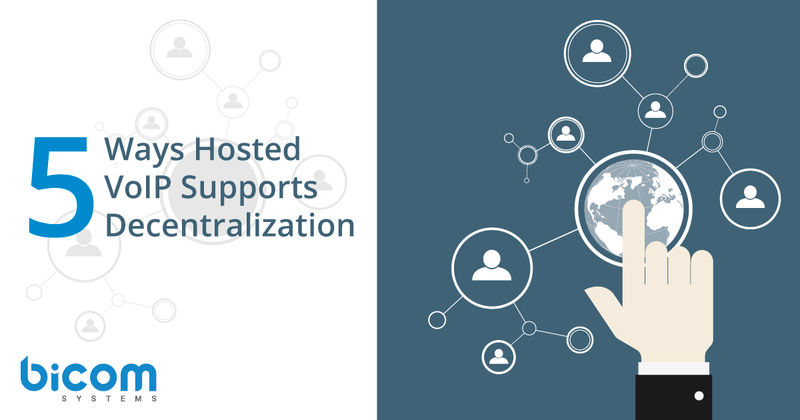 Another benefit of hosted VoIP and decentralization is continuity. With on-premise systems, disaster recovery is up to the company. But with hosted VoIP, the system is in a remote data center and mirrored and different locations. In case of natural or other disasters, service should continue uninterrupted in all locations. 5. Hosted VoIP necessitates less IT. Finally, hosted VoIP takes the burden of IT maintenance and support off the company. The provider can do as little or as much as needed. This is particularly useful for companies with multiple locations and home workers that do not want to hire IT staff all over the world. If you are a telecom that wants to grow, hosted VoIP may be the right option for you. Sign up for a FREE account to learn more today.